Thecotheus crustaceus, photographed by Gilbert Moyne. 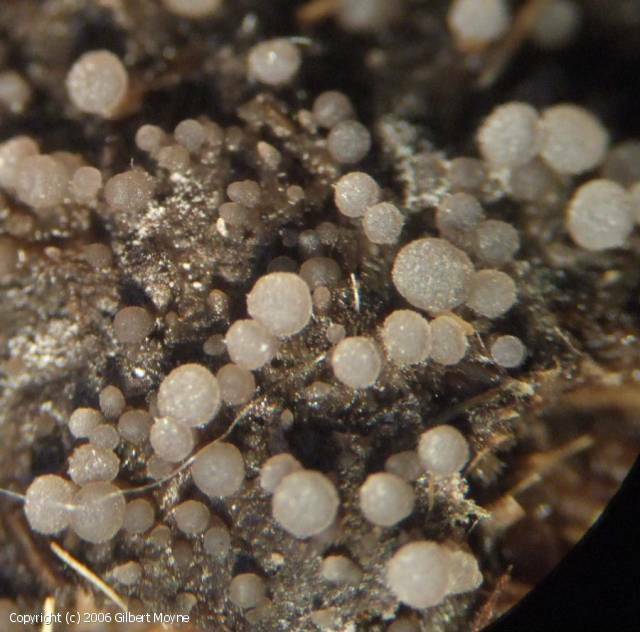 Thecotheus is a genus of fungi often found growing on animal dung. Characters (from Yao & Spooner 2000): Apothecia sessile, globose to subglobose or cylindrical, rarely pulvinate to lenticular at first, becoming cupulate to discoid, white, becoming grey, yellow, orange to brownish; ectal excipulum of textura angularis and medullary excipulum of textura intricata and textura globulosa; asci operculate, cylindric, 4- to 32-spored (rarely 64-spored), wall amyloid, protruding from the hymenium at maturity; ascospores ellipsoid, rarely subglobose, eguttulate, hyaline to pale yellow, smooth or ornamented with granules or warts, having polar apiculi in some species, with a thick mucilaginous perisporic layer; paraphyses filiform, septate, hyaline or sometimes containing purple-brown granules. [NU03] Nagao, H., S. Udagawa, N. L. Bougher, A. Suzuki & I. C. Tommerup. 2003. The genus Thecotheus (Pezizales) in Australia: T. urinamans sp. nov. from urea-treated jarrah (Eucalyptus marginatus) forest. Mycologia 95 (4): 688-693. Yao, Y.-J., & B. M. Spooner. 2000. Notes on British species of Thecotheus (Ascobolaceae, Pezizales), with reference to other species of the genus. Kew Bulletin 55 (2): 451-457.